Last week marked an important shift in executive policy on fossil fuel leasing: the Interior Department announced a moratorium on new leases for coal mined from federal lands, pending a comprehensive reexamination of the decades-old coal leasing program. Interior will prepare a Programmatic Environmental Impact Statement (PEIS) to examine how the coal leasing program can be “modernized” to reflect current environmental, economic, and social considerations. The PEIS will include consideration of greenhouse gas (GHG) emissions from both the production and consumption of federally mined coal. Interior’s announcement came on the same day that the Sabin Center submitted a comment letter on the Supplemental Draft EIS (SDEIS) for the United States Forest Service (USFS)’s proposal to exempt approximately 20,000 acres of national forest from the Colorado Roadless Rule for the purpose of coal mining and development. The SDEIS is unique in that it is the first EIS for fossil fuel extraction that contains a detailed assessment of downstream greenhouse gas (GHG) emissions and the corresponding cost of those emissions. It will likely serve as a precedent for other EISs—including the PEIS for the federal coal leasing program—and thus it is critically important for USFS to conduct an accurate assessment of GHG emissions and economic impacts. USFS does not account for the cost of methane emissions, despite the fact that a Social Cost of Methane tool exists and is currently used by EPA to evaluate those costs. USFS uses a “lower bound” estimate of the Social Cost of Carbon (SCC) that is inconsistent with the methodology recommended by the Interagency Working Group on the SCC and the practice of other federal agencies. USFS’s calculation of nationwide economic benefits is premised on the assumption that an increase in domestic coal production will result in a shift towards greater domestic coal use, which will reduce electricity prices. But USFS does not discuss the fact that existing federal regulations—most notably, the Clean Power Plan—will require a serious reduction in the proportion of coal-fired generation in the nationwide electricity mix. USFS also fails to discuss the inconsistency between the proposed exemption and federal policies and commitments aimed at reducing GHG emissions, such as our Intended Nationally Determined Contribution (INDC) for the Paris Agreement. 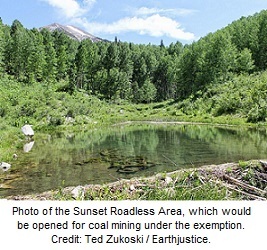 In our comment letter, we urge USFS to revise its analysis to account for these deficiencies, and to reject the proposed exception to the Colorado Roadless Rule.